Black to Blonde In One Session? No Problem! 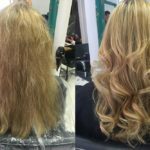 This hair colour is an amazing transformation by our Senior Stylist; Ross Anthony. Here you can see box dyed hair with built up colour, transformed to this beautiful dark Ash Blonde. Ross worked hard to achieve this, but he was able to do it in one visit, and his client was thrilled with the result. It’s important to note that this wouldn’t have been possible without Olaplex, which protects the hair as it’s being coloured. Using Olaplex means we can do more for you and really push the boundaries in terms of what is possible for your hair colour.